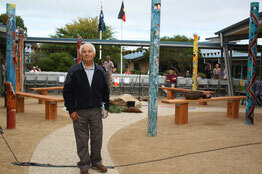 On Wednesday 18th March the Learning Stone at the Peninsula Specialist College was officially unveiled. 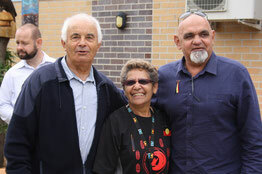 The Learning Stone area was initiated by Koorie Education Support Officer John Murray and enthusiastically adopted by Deb Koop, the Koorie Education Teacher at the College with the support of the indigenous school community and Aunty Marg, staff, students and parents of the College. The design was done by students who had a major role in the development of the project. 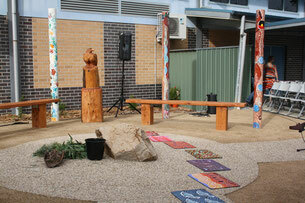 It is an area for contemplation, meditation, story-telling (yarning) and conversation. The opening ceremony was an emotional event and the students entertained the many visitors with their singing, dancing and music. It was a tribute to the college staff and many others who worked so hard to put on a terrific celebration. As part of the official opening a traditional smoking ceremony was conducted for all the students and visitors by Aunty Fay Muir. The morning tea after the opening was prepared by the students and was well appreciated by all. The Rotary Club of Rosebud-Rye was proud to have been able to make a contribution that allowed the project to happen and we thank our member, Pat Sansonetti, who did most of the ground works. Peninsula Specialist College is a purpose built school situated in beautiful surroundings on the Mornington Peninsula with distant views to the sea, surrounding hills and vineyards. It is a dual mode setting for students with a diagnosed intellectual disability. The school caters for students of the ages 5 – 18 years old in its primary and senior Departments.